This question may not look as an important one and in fact it is just out of curiosity. Ethernet ports usually have two light indicators of activity (blinking leds). Yes, I know that they indeed indicate activity, but why do we need that for Ethernet ports while we don't for other interfaces? Is there any official explanation for that or is it just a matter of tradition nobody cares about? Or else? Looking forward to see your knowledge or ideas on the topic. Yes, the lights can be very helpful when diagnosing problems - especially when dealing with non-managed switches or remote diagnosis with unexperienced users. Rule of thumb: no link light = layer 1 problem; link light but no traffic = layer 2 problem (or higher). Many switches can signal multiple infos (possibly using a toggle button): link speed (none/10M/100M/1G/10G), half/full duplex mode, slow/fast traffic, PoE available/applied, high error rate, inserted transceiver accepted/rejected and more. Most of these are very helpful when something doesn't work. With other (shorter-range) interfaces, most often the other side is in the same room - that way, it's much easier to get by, even without link and traffic lights. With Ethernet, the far side can be in another room, another building or even in another city. You'll be glad to have a quick, local info light. It's the network port equivalent of asking someone if their computer and/or monitor is actually turned on (and/or plugged in) when they complain about the screen being dark. A dumb question... but its amazing how many times they come back with a dumb answer. Still, those are the best, most easily solved issues. The patterns of blinking lights on a switch can give you a quick overview of network health. I used to work at a medium-sized company of about 100 staff, 250 PCs, a dozen servers, and the main server room was across the hall from IT's offices. The server room had windows so we could see the racks, consoles, etc., and we could see the status LEDs of the core switch that all the servers and remote switches connected to. Since we'd glance at the switch and all the other blinky lights many times a day, we'd recognize normal and non-normal patterns. We knew which ports had the busiest and least busy servers, so if we didn't see the right amount of activity, we'd know we should take a closer look. The LEDs on Cisco equipment has a function. 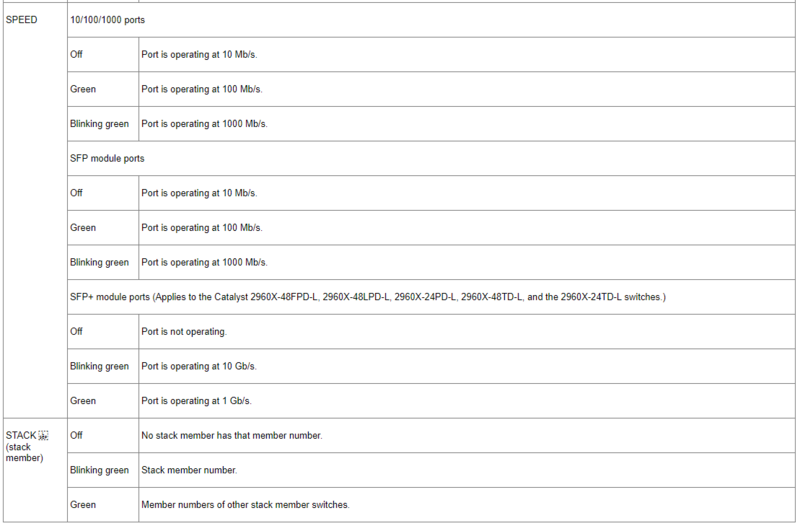 For instance, below is an example from the Cisco 2960-X Series access layer 2 switch. The LED indications changes from model to model. This is just one example. You can use the switch LEDs to monitor switch activity and its performance. Switch LEDs and Mode Button for the Catalyst 2960-X Switch. This figure shows the switch LEDs and the Mode button that you use to select a port mode. RPS = redundant power system—only on switch models that support RPS. Only on switch models that support PoE. Only on switch models that support stacking. The RPS LED is only available on switch models that have an RPS port. The port and module slots each has a port LED. As a group or individually, the LEDs show information about the switch and about the ports. To select or change a mode, press the Mode button until the desired mode is highlighted. 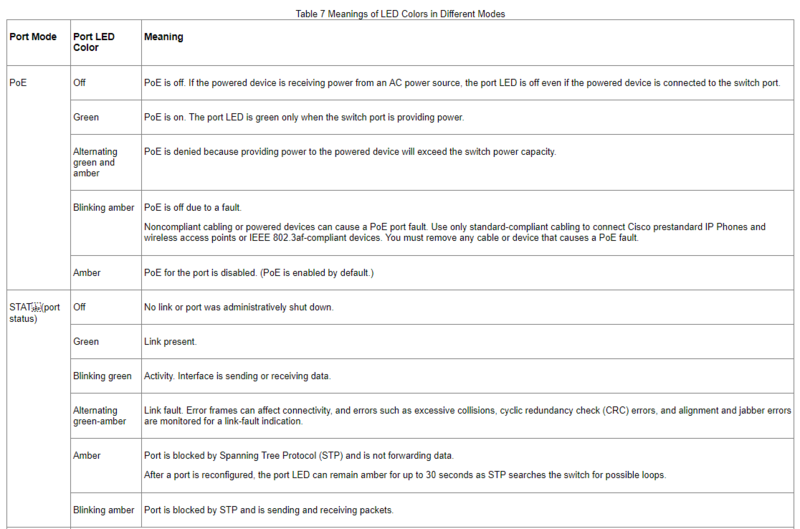 When you change port modes, the meanings of the port LED colors also change. If your switches are stacked and you press the Mode button on any switch, all the switches display the same selected mode. For example, if you press the Mode button on the stack master to display SPEED, all the other stack members display SPEED. Even if PoE mode is not selected, this LED still shows PoE problems if they are detected. Yes, it is useful. You can see interface activity and sometimes based on the blink rate how much traffic is going via the interface, although some systems artificially reduce the blink rate. Although other ports often don't have a blinking status LED, such a LED could be useful for other ports as well. For example, my Canon EOS 2000D DSLR camera has a status LED that indicates not only Wi-Fi activity but also USB activity. So, I can very easily see when it's safe to turn power off and disconnect the camera from the USB port: if the LED is blinking, files are still being transferred to the computer. Some USB mass storage devices also have a blinking LED. For example, my USB hard drive has a blinking LED, and even some low-cost USB pen drives happen to have a blinking LED! Not only that, but you often see the link speed on Ethernet switches from the LED color and which LEDs are on and which are off. I can far more quickly diagnose link speed issues just by looking at the LEDs than logging in the web management console with a password. Also, some cheap switches lack a management interface. If you have a non-smart switch, the only way to verify negotiated link speed in switch-switch interconnections is via the status LEDs. I wish more devices had a blinking LED. That'd be great e.g. for USB: to quickly verify if it's using USB1, USB2 or USB3 and see data transfer from blink rate. Can a Ethernet port be a data input or data output port? Can I connect to Cisco router's AUX port from a switch Ethernet port?